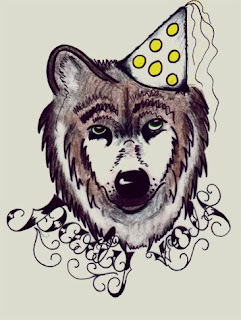 Party Wolves in my Skull: Anti-Wolf Hatred Targets Party Wolves! Anti-Wolf Hatred Targets Party Wolves! Hello everyone! My name is ♥♥♥ Sophie ♥♥♥, and I'm the female member of our little pack of Party Wolves. I apologize for Rex's recent post. He doesn't really "get" technology. Anyway, I wanted to take a few minutes of your time to bring an important issue to your attention. Zealous anti-party wolf hatred has driven these amazing animals to extinction in the past: Party Wolves disappeared from the landscape last century after decades of trapping, shooting and poisoning! Lawless killers have taken the lives of 35 party wolves in Arizona and New Mexico since their reintroduction -- including two all-important alpha males last year who were simply playing a game of Texas Hold Em’ and putting down a six-pack of cheap lager. But only two poachers have been caught and prosecuted for their crimes. And anti-party wolf extremists in Congress have recently introduced legislation that would remove vital federal protections for these scarce animals that are struggling to survive in the suburbs and urban centers of America -- a move that would virtually doom these wolves to a second extinction in the wild, or drive them to find shelter in the vacant skulls of human beings. Despite the ecological value and the sheer natural beauty of the Party Wolf, millions were trapped, poisoned, or shot to death during the first half of the 20th century, victims of unfounded fear and ignorance. They are victims of discrimination, simply because they don’t have jobs and sit around playing video games and getting high most of the time. Fortunately for the Party Wolf, however, the 1960s and 1970s launched the modern environmental era, bringing about landmark conservation statutes including the Endangered Species Act, the cornerstone of America's wildlife laws, as well as the advent of the medical marijuana movement, which allowed the Party Wolves to score much more easily. Shortly after the Act's passage in 1973, the Party Wolf was identified as endangered or threatened in the lower 48 states and declared a candidate for species recovery. As party wolf populations continue to grow, incidents of wolves raiding fast food restaurants will inevitably increase. While these losses are a tiny fraction of the losses that burger corporations sustain, we recognize that successful party wolf recovery depends on local community acceptance. Much of this involves educating the public to dispel myths and half-truths about party wolves, and engaging members of the community as partners to prevent conflicts with errant eyeballs, skull owners and giant water-mammals who drive muscle cars. Help save America's Party Wolves! Read our story when the debut novella by Michael A Rose “Party Wolves in My Skull” is released in winter of 2011 and keep watching www.partywolves.com for more!